HWI has fourteen active research sites throughout the western U.S. HawkWatch scientists monitor raptor populations and look for trends in their numbers. Like Signals of Spring students, these researchers make interesting discoveries by using satellite data to track the birds. Last year, for example, one golden eagle was tracked in southern Mexico, much farther south than this species was known to travel! 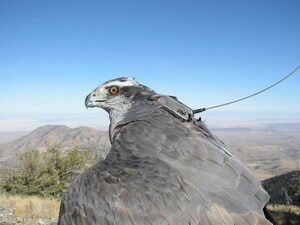 This spring, HWI is satellite tracking almost twenty raptors including red-tailed hawks, golden eagles, and goshawks. HawkWatch scientists also use banding to study even more animals. The bands are fitted around a bird’s leg, enabling scientists to give each bird an identification number and study populations. Both tracking methods provide data for researchers to study migration patterns, flyways, and habitats. One major focus at HawkWatch is education. Thom Benedict, Director of Education for HawkWatch International is excited to be working with Signals of Spring students again. He believes that it is very important for students to be involved in scientific research. Thom explains that when “kids have a direct experience with doing science, and come to appreciate it . . .” they can “ . . . help to protect the animals in the future.” Thom stresses that students should be educated about raptors and the human threats to them. The number one threat to birds, and most animals, is habitat loss and degradation. For raptors in particular, threats to their habitats include illegal hunting and poisoning—most often by pesticides and lead. Thom adds that people must be educated about these threats so that they make good environmental choices.